Besides battling wizards and dragons, Ronnie James Dio has gone head to head with such heavy-weights as Ozzy Osbourne, Gene Simmons, and even his former and now current band-mates Tony Iommi and Bill Ward. Ronnie is currently involved in the biggest and most fierce battle he has ever had, and we need to send him our prayers. 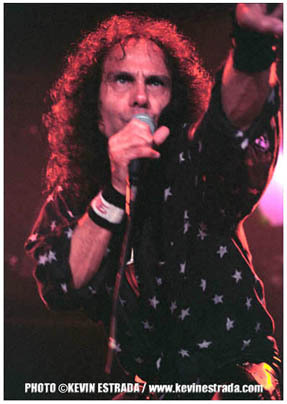 Just before Thanksgiving of 2009, Ronnie James Dio was diagnosed with the early stages of stomach cancer. He jumped right into his cancer treatments, and despite canceling his European Tour, Dio and Heaven & Hell will perform in July at the High Voltage Festival in London. I have had the honor to have met and worked with Ronnie a handful of times, and I can honestly say that Dio is one of, if not THE, nicest and most down to earth people in heavy music that I have ever, ever met. For a man who has helped to bring Heavy Music to the masses as well as spearheading numerous charities and community fundraisers, he is genuinely grounded and modest. The first time I met him, I thought I was going to crush his bones when we shook hands…and I am not much bigger than he is. Besides, if it weren’t for Dio, who knows what two fingers we would be sticking in the air! You are currently browsing the the KEVIN ESTRADA blog blog archives for January, 2010.